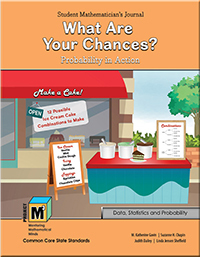 In this Project M3 unit, students begin their exploration of probability as a measurement of the likelihood of events. They should have had earlier experiences with this topic by describing events as certain, likely or impossible. What Are Your Chances? was designed to engage students as mathematicians conducting and analyzing experiments that involve the likelihood of events happening. They may have had some prior experiences such as predicting which color tile would be drawn from a bag of assorted color tiles or which number might be rolled on a number cube. This unit extends beyond the actual activities by focusing on the mathematics behind these experiments. Students will have an opportunity to think deeply about the big ideas of probability as they conduct experiments, gather data and analyze results. As true mathematicians do, they will be predicting, discovering patterns, making generalizations and justifying their reasons. They will see how mathematics is used in real-life situations as they create a Carnival of Chance using games constructed with the laws of probability. In Chapter 1, students begin the unit by exploring situations, collecting data and playing games. In doing so, they encounter the concepts of equally likely events, experimental and theoretical probability and the Law of Large Numbers. They are introduced to the special vocabulary associated with probability and are encouraged to use these terms throughout the unit. They learn a new strategy for collecting and organizing data known as a tree diagram and apply what they have learned to compound events. These are indeed complex situations that require high-level mathematical analyses by our student mathematicians! The second chapter enables students to take these new concepts and apply them to real-world situations. The situations in this case are games of chance. Students will be analyzing and creating games throughout this chapter, culminating in the class putting together a Carnival of Chance. In a highly motivational context, they have an opportunity to use mathematics to create interesting games and thus see another real-world arena where mathematics plays a crucial role.